Inspiring Bella Crafts: July 18 Challenge Punches. July 18 already, another challenge with Whimsy. The challenge this week is Punches and edgers. I wanted to do something a little bit different with this image. I have a 2 in 1 punch from EK that's how I did the border on each side. I also used a border punch from Martha Stewart to do the little dark purple piece around the Fairy. All you do is border punch a strip of paper and score it every 2/8 ths of an inch on a score board and accordion fold it. Then you just add a bit of glue on the point of each fold and I added it to the back of the image piece of paper. Really easy and it gives you a great look. 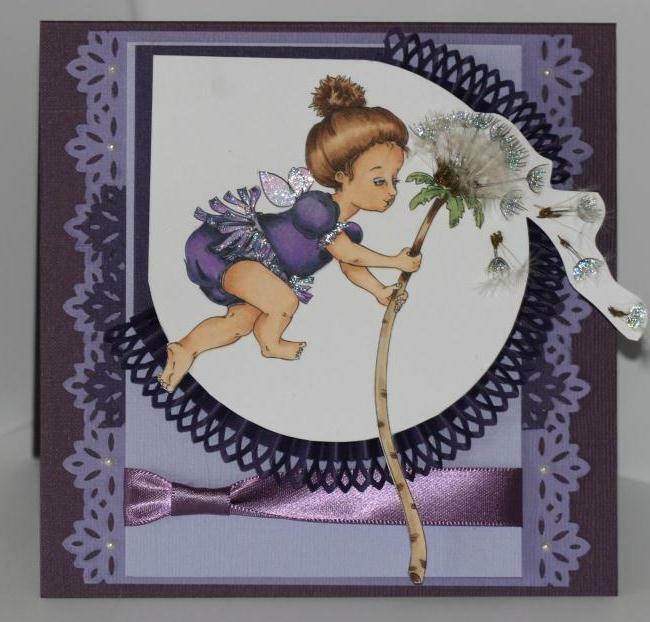 I used an image from Whimsy Stamps called Faerie Dandelion created by designer Lia Stampz. She is so cute, very summery. I also added dandelion pieces. 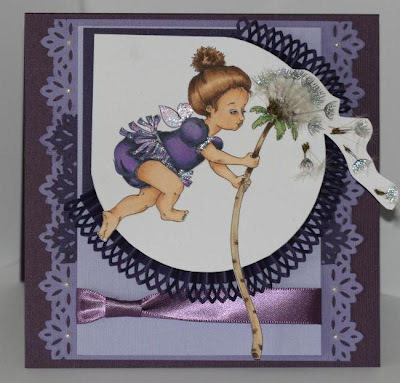 You can click here to jump over to the Whimsy Challenge blog to play along or to check out the wonderful DT creations. A closer look at my copic colored image. For something a bit different and out of the box a picked a dandelion on my walk with my dogs and added some real pieces by gluing them with Glossy Accents. I wanted to give it a more realistic feel. 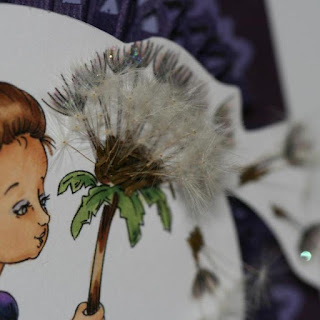 A close up of the dandelion fluff glued on. Supplies: Whimsy digital stamp Faerie Dandelion stamp, copic markers, EK 2 in 1 border punch, Martha Stewart border punch and Score board, Bazzill cardstock, Stardust stickles from Ranger, Zva pearls, ribbon. OMGosh this wonderful, I like the dandelion touch, only you girl...Love the colors, and the image rocks! Way to go!